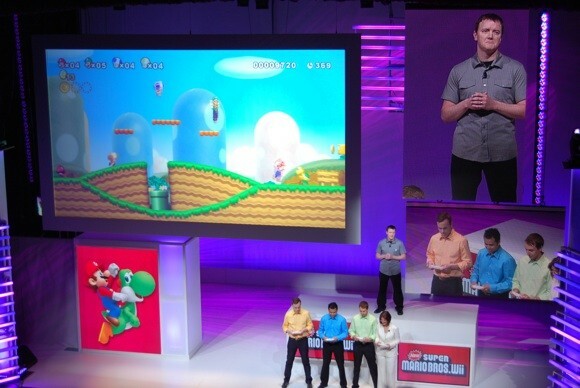 Nintendo kicked off their E3 2009 press conference with the announcement of The New Super Mario Bros. Wii, afour-player co-operative take on classic 2D Mario gameplay. It was almost a perfect surprise, but close enough. The New Super Mario Bros. Wii combines the classic 2D gameplay of the original Super Mario Bros. with four-player co-operative play to create a new Mario experience. Remember watching your friends play the game on the NES? Imagine being able to join in, with a scaling screen. It’s like four swords, but with 2D Mario! The New Super Mario Bros. Wii will be available this Holiday season.